The Pentagon is trimming its projected total military end strength and shifting its force growth to better align against near-peers Russia and China, according to the 2020 budget released Tuesday. 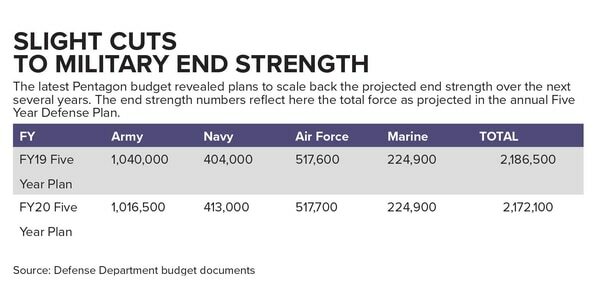 The total end strength planned for in the fiscal year 2020 budget is for the military to reach 2,172,100 forces by year 2024, down from the 2,186,500 that had been planned to be reached by 2023 in the Pentagon’s budget last year. That includes both active-duty and reserve component troops. The Army missed its end strength goal this year. Can it make up the setback? Senior leaders discuss the fallout from missing this year's recruiting goal. To trim and shift, over the next five years the Pentagon is proposing cutting the Army’s total end strength from a previous goal of having 1,040,000 active and reserve forces by 2023, to having 1,016,500 on hand by 2024. Under Secretary of the Army Ryan McCarthy said the Army’s projected cut also reflects financial reality and the need to slow its growth. The Army also does not want to lower recruiting standards after missing its recruiting goals by more than 6,000 forces last year. Under the Pentagon’s new plan, the Navy, would grow to 414,000 forces by 2024, and the Air Force would gain a modest 100 additional troops. The Navy is under increased pressure to counter both China’s growth in the Pacific and increased Russian expeditionary naval presence, particularly its submarine presence, throughout the European theater of operations; the Air Force will be adding extra roles as it moves forward on establishing the administration’s new space force. 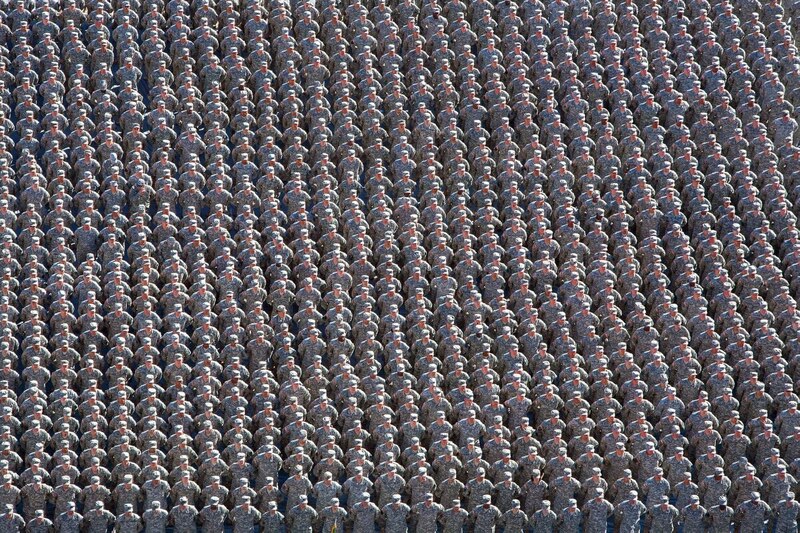 The Army's end strength showed no net gain in 2018, after the service missed its recruiting goal by 6,500. The budget “moves past the Desert Storm model,” said Defense Department Comptroller Elaine McCusker. "Deterring or defeating great power aggression is a fundamentally different challenge than the regional conflict against rogue states that were the basis of our planning constructs for the last 25 years. " “China and Russia will not fight us the way we have gotten used to fighting," McCusker said.